It’s been a long time since I’ve read a full book of poetry! I thoroughly enjoy reading poetry occasionally, but I usually just read one or two at a time. Chatterbox Poems by Sandy Day has poems ranging from angry to lighthearted. Her emotions stand out as raw and real. 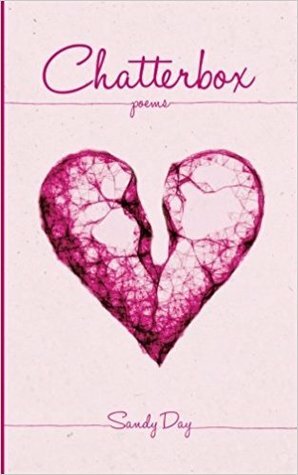 “Chatterbox is a collection of one hundred and ten poems, tiny tellings written during a year of marriage disintegration. The poems explore a world of bewildering emotions ranging from sadness and terror to anger and enlightenment. The reader enters a world conjured from fairytales and dolls, the Garden of Eden, and the Wizard of Oz; the pages abound with moths and mice, dogs and horses, roosters and crows, oranges and apples, the moon and the sun. A creative force, exploding after decades of silence, inspires the Chatterbox poems. The poet struggles to attend to a Muse that wakes her each morning, urging her to capture a spirit igniting inside her. The poet observes her own life as it falls apart and fragments then miraculously turns her outward toward others. When I was in high school, I was on the staff of the school magazine. Each year we printed a book of poetry, short stories, and artwork all written and created by students. I loved it! It may have helped that I had a few of my poems included in the book. Needless to say, I enjoy reading (and writing) poetry. So when Sandy Day asked me if I’d review her poetry book, I had to say yes. There are 110 poems, and each of them is filled with emotion. I love how she uses imagery and descriptive words. Sandy writes in a way that allows her emotions to be fully felt by the reader. I tended to be drawn to the more lighthearted poems, but there are poems that cover a full range of emotions. Stale, which my teeth need to chew). lake, stickiness on my fingers and tongue. If you’re in a poetry state of mind, this book is for you, especially if you feel angry or raw emotion. I have been teaching an early morning poetry class at my kids’ school. It’s for 4th, 5th, and 6th graders, and we have been having so much fun! Each time we come to class I spotlight another poet, and Shel Silverstein is one of my favorites! I have a couple of his books, but I had no idea how many he has! I went to the library and checked out a bunch more for the class, and we have enjoyed going through all of them. I thought I’d put all the poetry that’s on my brain to use on my blog, and do an author spotlight. Enjoy! 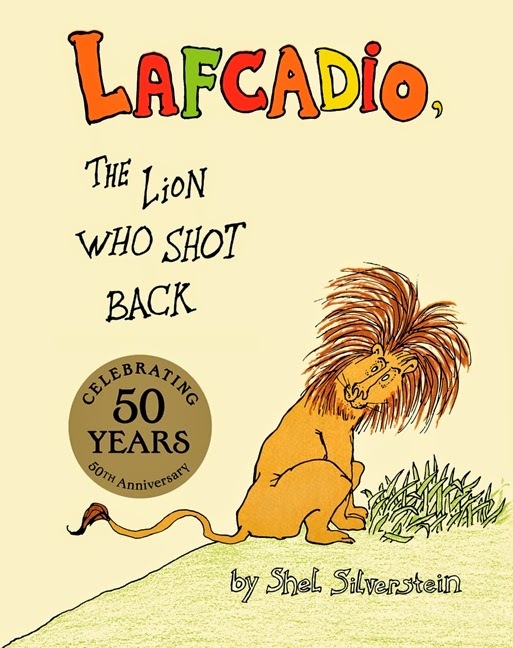 “And now . . .a story about a very strange lion—in fact, the strangest lion I have ever met.” So begins Shel Silverstein’s very first children’s book, Lafcadio, the Lion Who Shot Back. 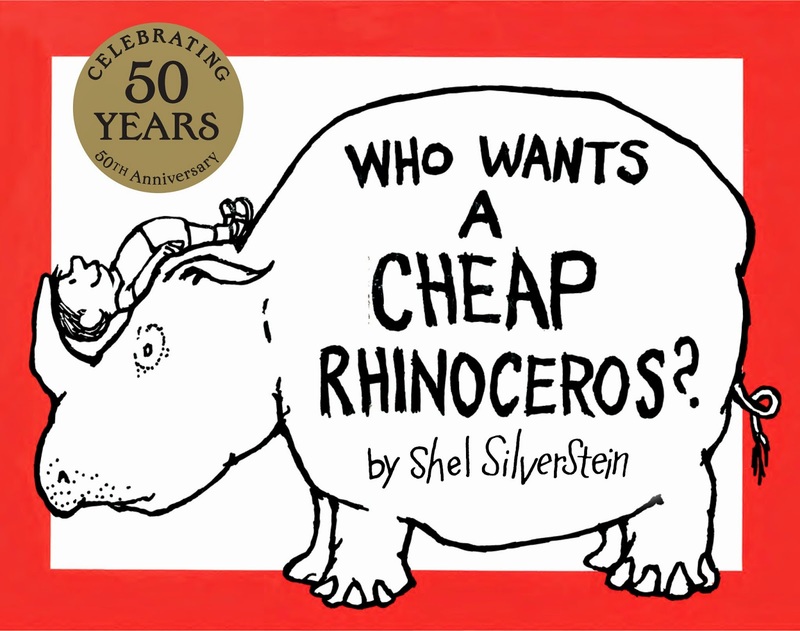 It’s funny and sad and has made readers laugh and think ever since it was published in 1963. If you had a giraffe . . .
and he stretched another half . 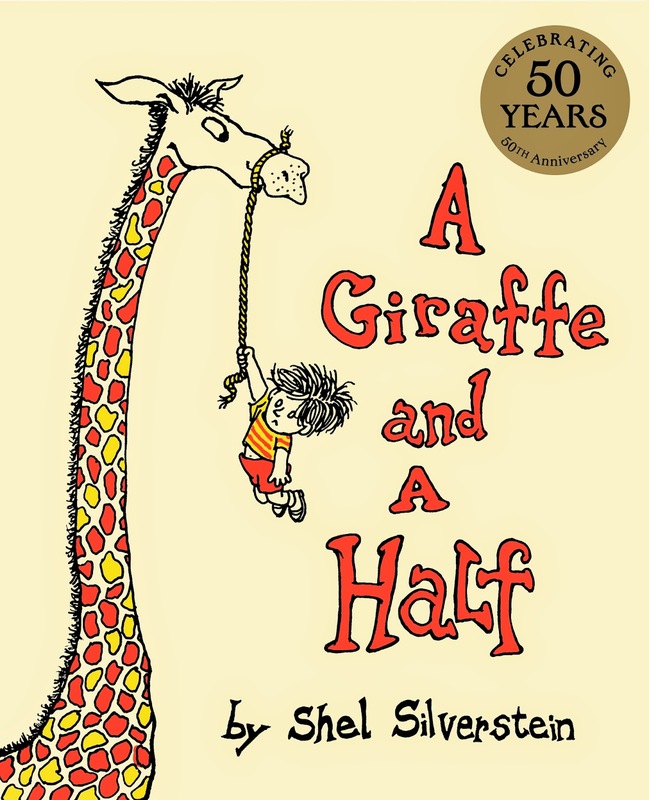 . .
you would have a giraffe and a half . . .
is how it starts, and the laughter builds to the most riotous ending possible. 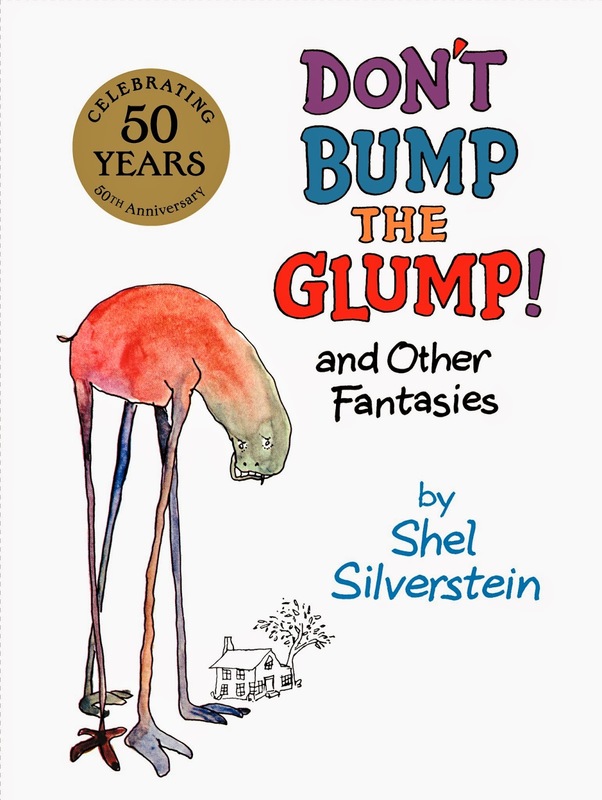 Shel invited children to dream and dare to imagine the impossible, from a hippopotamus sandwich to the longest nose in the world to eighteen flavors of ice cream to Sarah Cynthia Sylvia Stout who would not take the garbage out. 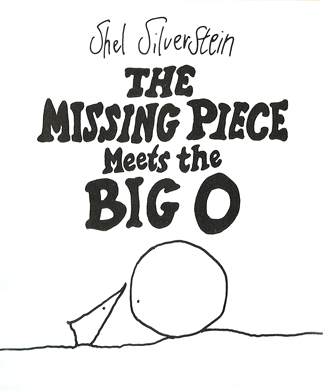 This was followed by The Missing Piece, published in 1976, and The Missing Piece Meets the Big O, published in 1981—two companion fables that explore the concept of fulfillment. 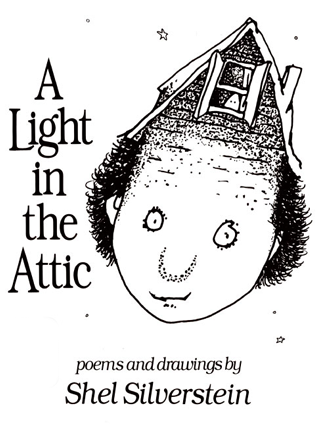 With his next collection of poems and drawings, A Light in the Attic, published in 1981, Shel asked his readers to put something silly in the world, not be discouraged by the Whatifs, and turn on a light in the attic. There’s a light on in the attic. And I know what it’s about. He urged readers to catch the moon or invite a dinosaur to dinner—to have fun! School Library Journal not surprisingly called A Light in the Attic “exuberant, raucous, rollicking, tender and whimsical.” Readers everywhere agreed, and A Light in the Attic was the first children’s book to break onto the New York Times bestseller list, where it stayed for a record-breaking 182 weeks. 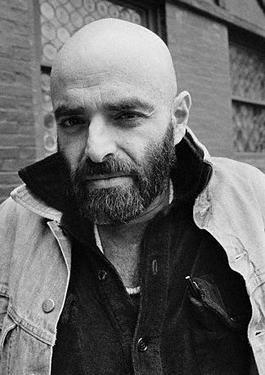 Shel Silverstein was born in 1930. He grew up in Chicago and created his first cartoons for the adult readers of thePacific Stars and Stripes when he was a GI in Japan and Korea in the 1950s. He also learned to play the guitar and to write songs, including “A Boy Named Sue” for Johnny Cash and “The Cover of the Rolling Stone,” sung by Dr. Hook. He performed his own songs on a number of albums and wrote others for friends, including his last, in 1998, “Old Dogs,” a two-volume set with country stars Waylon Jennings, Mel Tillis, Bobby Bare, and Jerry Reed. 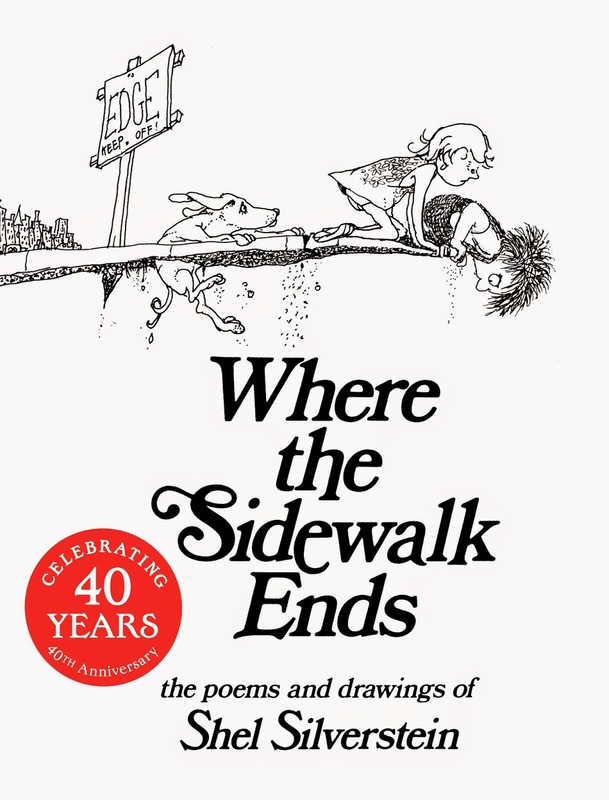 In 1984, Silverstein won a Grammy Award for Best Children’s Album for Where the Sidewalk Ends—“Recited, sung and shouted” by the author. He was also an accomplished playwright: His credits include the 1981 hit The Lady or the Tiger and The Devil and Billy Markham. He and David Mamet each wrote a play for Lincoln Center’s production of Oh, Hell!, and they later cowrote the 1988 film Things Change. A frequent showcase for Shel’s plays, the Ensemble Studio Theatre of New York, produced The Trio in its 1998 marathon of one-act plays. The world — from a different angle. 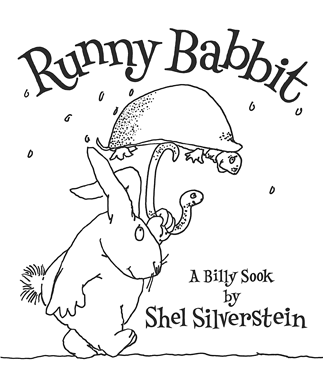 Shel Silverstein’s legacy continued with the release of a new work, Runny Babbit. 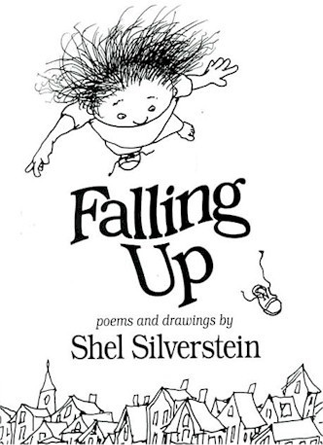 Shel’s first posthumous publication, conceived and completed before his death, was released in March 2005. Witty and wondrous, Runny Babbit is a poetry collection of spoonerisms, which twist the tongue and tease the mind! 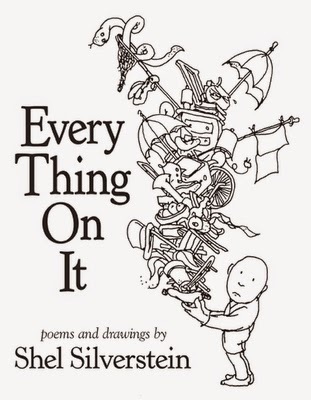 Then a new collection of Shel Silverstein’s poetry, Every Thing On It, was published in 2011, comprised of 140 never-before-seen poems and drawings that Shel had completed before his death. Say Hi-ho for the toilet troll, get tongue-tied with Stick-a-Tongue-Out Sid, play a highly unusual horn, and experience the joys of growing down! 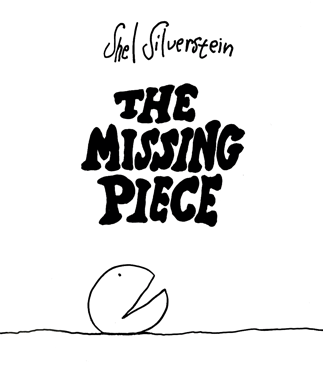 This book is filled with Shel Silverstein’s blend of humor and poignancy that bends the brain and opens the heart. These boots are a little too big. It’s a fact I am forced to admit. 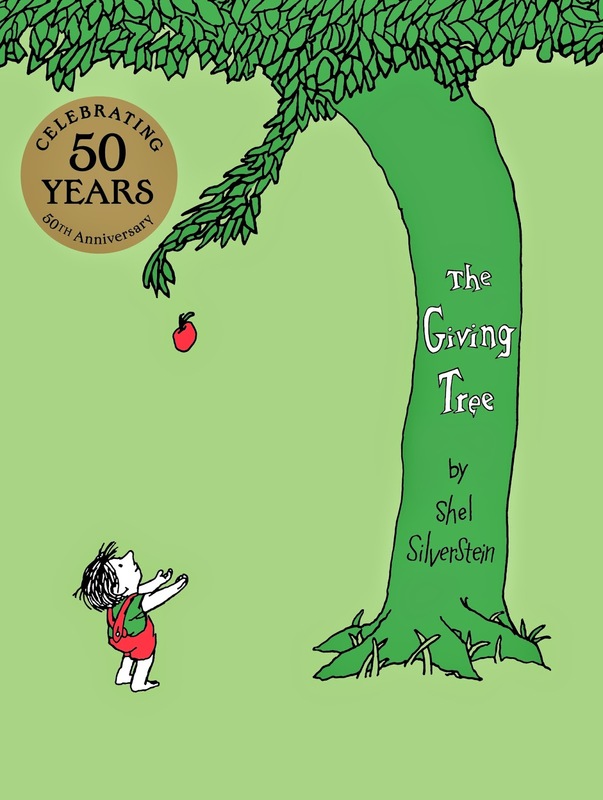 Shel Silverstein’s incomparable legacy is apparent in each one of his books and continues with every reader he inspires. When I am gone what will you do? Who will write and draw for you? kids that poetry can be fun!!! Visit this site for more info.! This is the first book I have read on an ipad, bought from itunes. I am quite familiar with itunes for music, but I did not know they had books. That is, until Ms. Hollenstein contacted me. This is so much fun! It is a cute concept and the fact that it is on an ipad/pod makes the kids automatically think it’s fun. I love that it is poetry. Poetry seems to be something that children are not as familiar with these days, and to make it available in this format is a great idea. The poetry is written well and the illustrations are very cute. I love the pages where the animals move or the objects are animated. Most of the pictures are easy to find, but a couple of them took a second look before I found them. I had hoped that a few more objects on each page would also be animated, but they weren’t. That’s ok. There is at least something on each page. This is something kids could do instead of a game, that would be entertaining and educational. I’m not sure how much they’ll enjoy it the second, third, fourth time, etc., once they know where everything is, but I think they’ll still like it. I watched a few of them a couple of times because they were so cute. 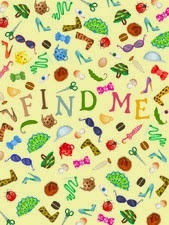 I love the concept of this book and think it is really well done. Yay for creativity, imagination, and uniqueness! Click HERE to purchase this book on itunes.